Article : A Ghetto for the Jet Set: Munich Faces Dark Side of a Housing Boom. Munich's property market is characterized by superlatives. 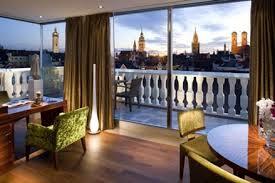 The real estate website Immowelt recently named the Bavarian capital Germany's most expensive city once again. 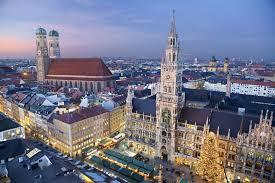 Average rents in Munich are €12.50 per square meter, or more than twice as high as they are in the rest of Germany. And those who would prefer to own can only afford it if they have high-paying jobs or a generous inheritance -- the average price per square meter is €3,680, or 124 percent higher than the statistical average in Germany. Munich is the most dramatic example of the potential effects of an overheated market. The rich and the beautiful are invading the city's former blue-collar neighborhoods -- and running up against organized resistance. Opponents of the unwanted gentrification have created a sticker that resembles a stop sign, but with the word "snob" printed inside the red octagon instead of "stop." In some neighborhoods, new residents are welcomed with particularly cordial slogans, such as: "Welcome to Giesing, you assholes." Unser Viertel, a local newspaper in the Giesing neighborhood, also chooses to address newcomers directly, writing on its website: "Speculators and yuppies out!" Local initiatives of citizens connected through Facebook and the Internet are fighting to preserve affordable housing in threatened neighborhoods, pitting themselves against "locusts," luxury renovators and jet-setters. Artists like cabaret performer Frank-Markus Barwasser, aka Erwin Pelzig, and comedian Michael Mittermeier are joining forces with low-income residents, while singer-songwriter Konstantin Wecker is warning against an onslaught of "wealthy riffraff." Indeed, the entire city is engaged in a war of cultures and classes, but one that no longer pits the lowest income group against the highest one. A study jointly commissioned by the Munich branches of the German Tenants' Association (DMB) and the German Federation of Trade Unions (DGB) found that, owing to high demand and horrendous prices, "many households are already experiencing significant problems with market access and services." According to the study, this applies not only to low-income groups, but also to the middle class. More and more people "live to work," it says, "but without making enough to live off." It's not rare to find people in Munich spending half their income on rent. In fact, many residents are having to pay even more than that, making the city unaffordable even for those who have taken on a second job. Although Munich reaches extremes seen nowhere else in Germany, this trend can also be witnessed in many of the country's other large cities. Indeed, real estate sales are booming all over the country. The IVD estimates that houses and condos worth €80.75 billion were sold in the first six months of 2011, a 20 percent increase over the same period the previous year. According to financial experts, investors are literally seeking refuge in material assets. Owing to uncertainty in the financial markets and very low interest rates on mortgages, Germans are opting to invest their money in "concrete gold." Surveys conducted by the market research organization Forsa indicate that a quarter of all private investors plan to invest in real estate. In Berlin, residential real estate sales went up by 48 percent, and prices jumped by 10 percent. Rents are also on the rise, climbing 6 percent in the first half of the year. Real estate broker Jones Lang LaSalle is calling it a "rally in Berlin rent prices." Hamburg saw €3.7 billion in real estate sales in the first half of the year, and markets in the western state of Hesse and the northern state of Schleswig-Holstein are also booming. In fact, the real estate market is even improving in economically troubled parts of eastern Germany. Investors are inundating the northeastern state of Mecklenburg-Western Pomerania, and eastern German cities like Halle and Dessau, both in the state of Saxony-Anhalt, are also becoming more attractive. Already in the late 1980s, then-Mayor Georg Kronawitter said that Munich's unfettered growth reminded him of a boiler. Whenever that boiler lets off excess steam, residents like Helga Flattinger are pushed out of the city. Still, there is no lack of new residents to replace her. Munich's population has grown by 11.8 percent over the last decade, and it's expected to increase by another 6.8 percent by 2025.